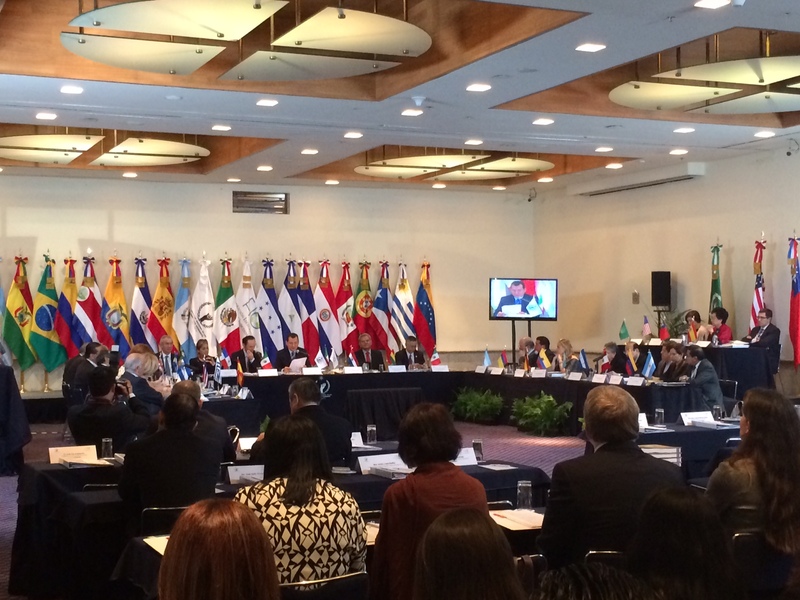 MEXICO CITY, MEXICO – As Secretariat of the Latin American Network, AIPR creates strategic institutional linkages to strengthen domestic prevention policies. Towards this end, AIPR is supporting the work of Latin American Ombudsman Offices and has developed a strategic alliance with the Ibero-American Federation of Ombudsman (FIO). Established in 1995, the FIO is a forum of cooperation for Latin American ombudsman offices. Through the exchange of best practices, it seeks to expand and strengthen the culture of human rights in FIO member states, which currently includes Andorra, Argentina, Honduras, Brazil, México, Bolivia, Nicaragua, Colombia, Paraguay, Costa Rica, Peru, Ecuador, Portugal, El Salvador, Puerto Rico, Spain, Venezuela, and Guatemala. The FIO also establishes and maintains partnerships with non-governmental organizations, like AIPR, towards the promotion of the rule law. On October 2, 2014, AIPR Director of Latin American Programs Eugenia Carbone and Director of Policy and Planning Samantha Capicotto attended the FIO’s XIX Annual Assembly. This year’s program focused on regional systems for the protection of human rights and included remarks by an array of Latin American ombudsman officials. Additional speakers included Dr. José Manuel Sánchez-Saudinós, Secretary General of the People’s Defender of Spain, and Ms. Dareen Aboul Naga of the Office of the Secretary General of the League of Arab States, who provided reflections on the Arab Court of Human Rights. The next day, on October 3, Ms. Carbone presented the work of the Latin American Network to the Assembly, while Mrs. Capicotto gave an overview of AIPR’s mission and programs. AIPR’s future engagement with the FIO is outlined a newly signed Memorandum of Understanding between our organizations. The MOU establishes a basis for a mutual cooperation in the fields of research and capacity building. Specifically, AIPR will assist in reviewing annual assessment reports on different topics in atrocity prevention covering all FIO member states.